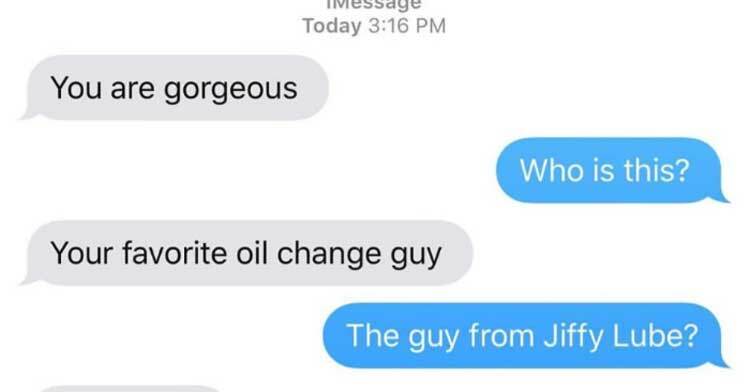 Jiffy Lube Worker Sends Customer Flirty Text, But Her Reply Will Have You Cheering. Now, more than ever, women are standing up for themselves against unwanted advances from men. Culture is changing, and as far as a lot of women are concerned, the men had better keep up or prepare to make a fool of themselves. 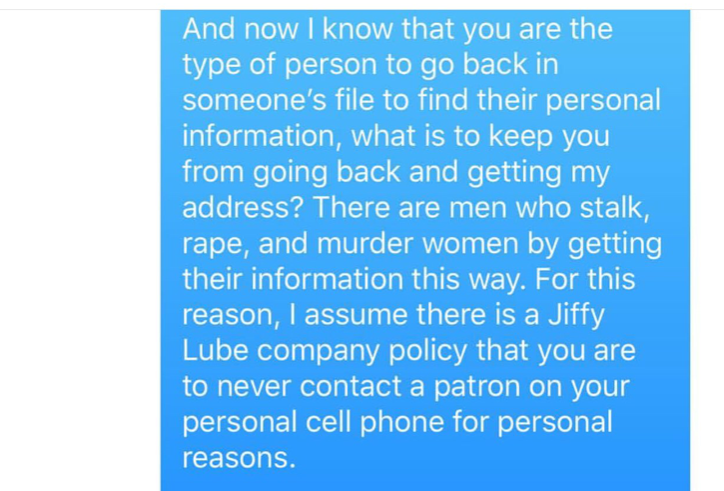 One Jiffy Lube employee was more than embarrassed when he messed with the wrong woman— he was downright lectured and put in his place. 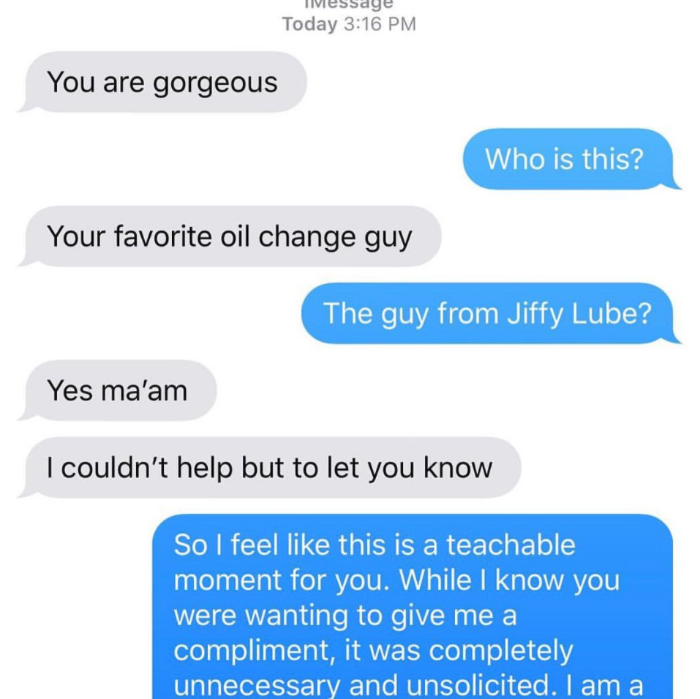 Recently, a woman on Twitter shared an exchange her sister had with a Jiffy Lube employee who thought it was a good idea to send her a text from his personal cell phone. The employee texted, “you are gorgeous” to the customer, she asked, “who is this?” and he replied, “your favorite oil change guy .. I couldn’t help but let you know”. That’s when “oil change guy” was taught a lesson. 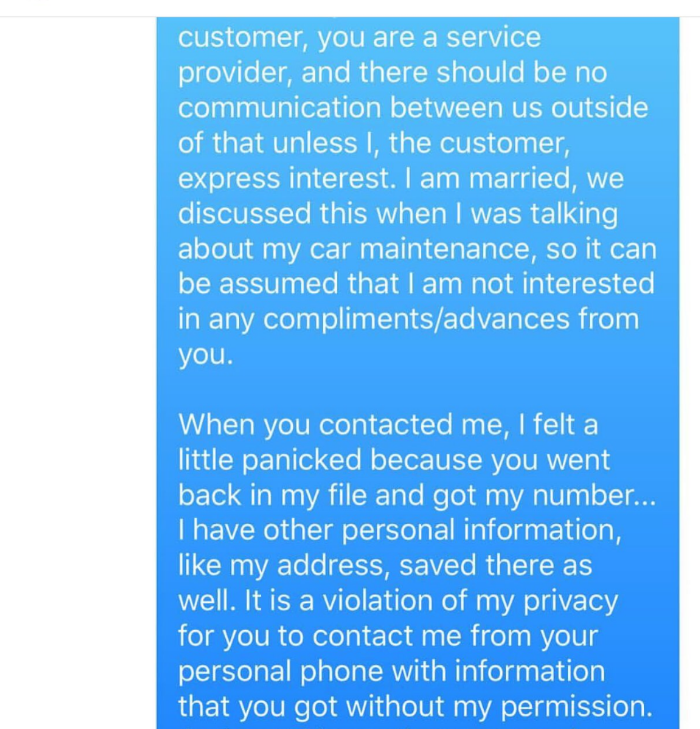 The (married) woman explained how violated she felt that this “gentleman” would go into her client file and get her information without her permission. 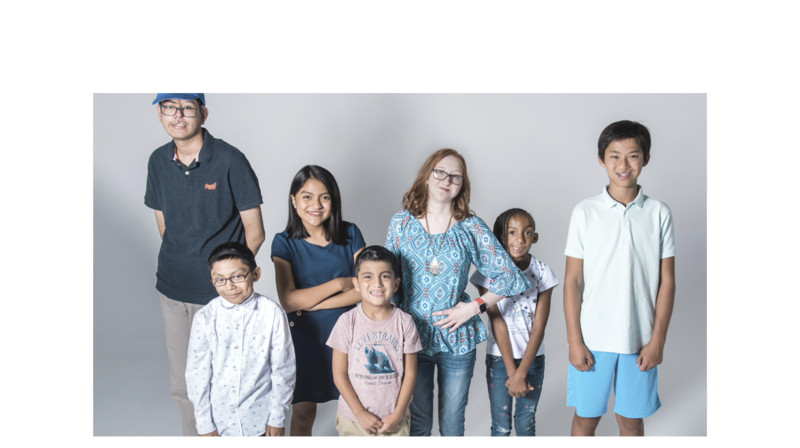 She explained to him that her file has a lot of sensitive information – such as her address – and that his seemingly innocent compliment made her feel unsafe. 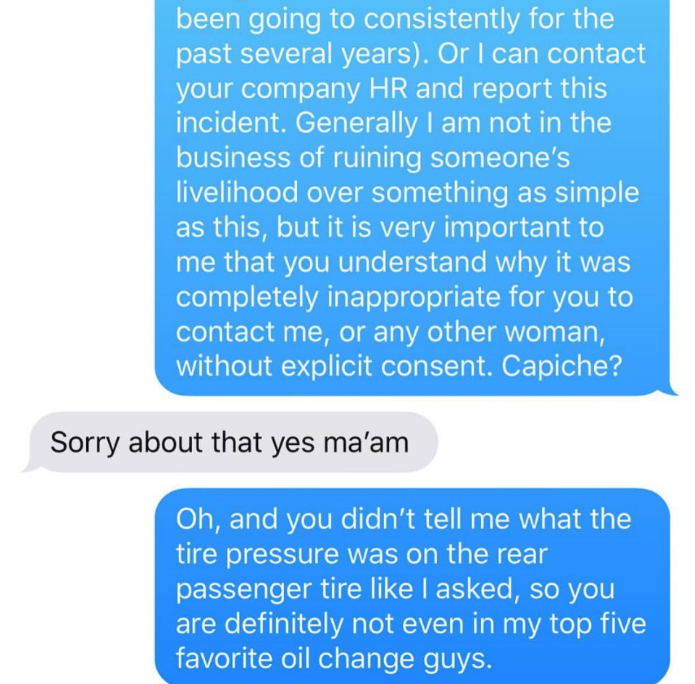 The brave (awesome) woman also reminded the employee that there is likely a Jiffy Lube company policy that prohibits this kind of behavior and that he put her in a “predicament” where she has to choose to report this violation or avoid going back to the service provider, despite the fact that she’d been going there for years. She could have just chewed him out or blocked him, but instead, she took the opportunity to explain why this kind of “compliment” is totally not cool from a woman’s perspective. From the employee’s response (a humble, “Yes ma’am.”), it’s safe to say he got the picture. Since the woman’s sister shared the exchange on Twitter, it has gone viral. In fact, it’s gained so much attention, Jiffy Lube responded to it and promised to take action. 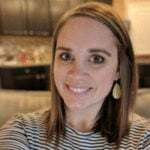 While everyone is happy to see Jiffy Lube take the issue so seriously, the real hero is still the customer who stood up for herself – and all women – so amazingly! Inspired by this story of courage? Be sure to share it with your friends and spread the word!